My name is Erica Knorr, and I first learned to crochet in a club called the "Walking Woolies" that a few teachers hosted at my elementary school for one year. However, I never had the patience to make scarves or blankets or anything, so two years later I began to make amigurumi. Initially, I only made patterns from a book I found when I went shopping with my mom, but eventually I branched out and found free patterns online. Although I always wanted to make my favorite characters, those patterns always cost money, so I could never buy them. I actually stopped crocheting for about five or six years after I started making amigurumi and only picked it up again about a year ago. Since then, I have been making free-hand patterns of Steven Universe characters because I absolutely love that show! Rebecca Sugar and the rest of the crewniverse just do such fantastic work with it, and I know a lot of young kids (and a lot of adults) are really into the show, too. So, I made the decision to post my patterns for free online as a thank you to all of the people whose patterns I used as a kid. My sincere hope is that this blog can help kids find patterns for their favorite Steven Universe characters, so that they can benefit from them the same way I have. My basic plan for the future is to make as many characters as possible, but as I am in college it may take me a while to create the dolls due to my class schedules and courseload. I have about 3-4 dolls planned for the summer and thereafter I'll try to do one per semester. Available patterns include Opal, Rose, Connie, Lapis, Stevonnie, and Garnet. 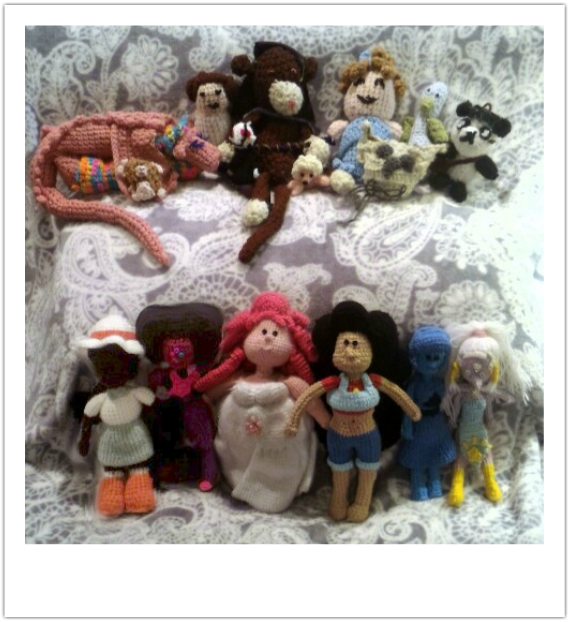 To the right you'll see a picture of almost every doll I've ever crocheted. The ones in the back are the ones I made about seven years ago, and the Steven Universe ones up front are the ones I've made in the past year. I wanted to showcase the dolls in the back so kids don't get discouraged if their dolls don't look exactly like the ones in the patterns because I always felt a little upset when mine didn't turn out exactly right. I just want you all to know that the dolls can still be unique and lovely in their own way because you put the time and effort into making them. Your love and care is all it takes to make a creation special. Creative Commons information is shown below! Here is a link to the simplified version, if anyone would like to know the exact terms of the license without having to sort through the legal jargon. This work by Erica Knorr is licensed under a Creative Commons Attribution-NonCommercial-ShareAlike 4.0 International License.